Phil Lord and Chris Miller’s original, titled The Lego Movie, which in retrospect reads as a punchline—the joke set-up being its greenlighting—translated the all-access everything of young people’s lives in 2014 into an overstimulated smorgasbord of pop cultural detritus. Everything is awesome when everything is accessible, Ninja Turtles and Batman and Harry Potter and Gandalf ripe for some intermingling, the raw materials of imagination at one’s tiny fingertips. Not romanticizing nostalgia so much as manifesting it, The Lego Movie looks back to one’s childhood with bright, belligerent joy at the simple act of making: of pulling from everything one loves to create new worlds, of trying and seeing what happens, of rebuilding. The guys who rebooted 21 Jump Street as a meta-comment on all art as reassembly then assembled a kids’ movie literally about the process of making that art. It was a revelation. 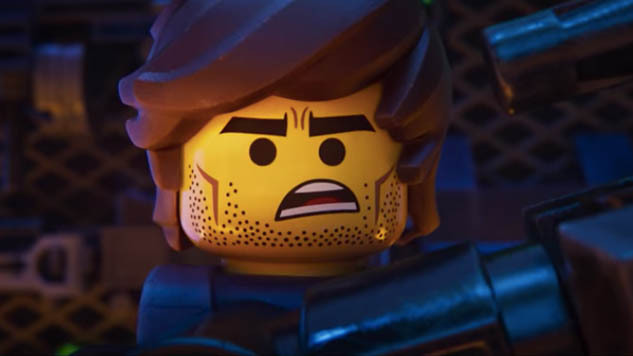 Its sequel, less so, but in the past half-decade (and two similar Lego movies later) there’s hardly a shred of anything original left that hasn’t been commodified into oblivion. So The Lego Movie 2: The Second Part blasts off into that oblivion, attempting to grow up with the younglings it once courted while, as well as it can given its hyperkinetic guiding koan of “everything is awesome is everything at once,” shooting for unexpected shades of nuance. Written by Lord and Miller, but directed by dependable animated studio hand Mike Mitchell, the second episode in the ongoing saga of Emmet Brickowski (Chris Pratt) and the citizens of Bricksburg starts only minutes after the first film, but feels like a lifetime separated. Lord and Miller seem to get that. They feel it too. Is everything still awesome? Short answer: No. Longer answer: Definitely not. There is a song about this. After the Duplos invaded at the end of the first flick, Bricksburg has been reduced to a Mad Max-inspired post-apocalyptic broodscape wherein nothing shiny or happy or big can survive without the Duplos returning, fixated, to ruin everything. IRL, the Duplos are the minions of Little Sister, Bianca, daughter to President Business/Dad (Will Ferrell) and foil to brother Finn (Jadon Sand), the little toddler girl now a young lady with a wide-ranging imagination of her own, played by The Florida Project’s Brooklynn Prince (kid’s a natural). All of Emmet’s friends have evolved with the new world, especially Lucy (Elizabeth Banks) and Batman (Will Arnett), who’ve taken up the mantle of Apocalypseburg’s protectors, even though the previous film established that everyone is special because everything is awesome, prematurely flattening whatever hierarchy a typical bureaucracy could establish with truly Millennial aplomb. But not Emmet: Lucy’s concerned that his unflagging optimism will be his inevitable undoing, so much so that when an envoy from a shapeshifting Queen (Tiffany Haddish), dubbed Watevra Wa’Nabi (get it), kidnaps the most important Master Builders in the ’burg—including Benny (Charlie Day), Unikitty (Alison Brie) and Metalbeard (Nick Offerman)—Emmet’s the only figure left behind. Out of his element, and fighting off weird visions of the “Our-mom-ageddon” (get it), he reconfigures his house into a spaceship and heads for the Systar (get it) System to rescue his friends. Adrift in the cosmos, Emmet’s saved from near-destruction by Rex Dangervest (also Pratt), a cheeky amalgamation of Pratt’s post-Parks and Rec action franchise personas, replete with an interstellar crew of Velociraptors and chiseled jawline and witty near-PG-13 one-liners. Rex is a better fit in Lucy’s cynical worldview, so Emmet asks the space hero to bestow upon him the manly ways of the cool tough guy. Together, they continue on to the Systar System, where Emmet will prove to Lucy that he can change with the times by resigning himself to despair. As one might expect, Emmet’s good heart wins the day over Rex’s testosterone’d might, and as an indictment of toxic masculinity, the casting of Pratt for both voices presents an ostensible argument for Andy Dwyer as an infinitely more valuable piece of pop culture than Star-Lord or Owen Grady, and The Lego Movie 2 as a welcome shaming of the worn out blockbuster archetypes to which Pratt today owes his superstardom. (Oddly, Bruce Willis makes a cameo as himself as John McClane, stuck preternaturally in the ventilation system, where he “lives now.”) But The Lego Movie 2 shames itself as well, because its success and purported $100M budget it owes to the leagues of pop culture pieces it inhales, including everything it poo-poos care of Pratt’s career (though a joke about Marvel quickly explains why no Disney properties can be found). It inarguably wouldn’t exist without Capitalism as an inescapable monolith of our time, here, at the End of History, pushing us toward an evolution, 2001-style (also alluded to in this movie) that collapses all time in on itself. Yes, there is time travel in this movie. Yes, Bill and Ted make an appearance. After a fake title card announcing its conclusion, The Lego Movie 2 reboots, refusing to quit without a happy ending. As a compromise, it admits: Everything is not awesome, but everything isn’t so bad either. How could it be when everything is everything? Perhaps this is the lesson on which kids can glom amongst this admittedly overlong, overwhelming experience: Yoda was wrong; trying is what matters. It’s a lovely lesson, and a lovely movie. It’s OK to be angry and sad and hurt by the world, because it will hurt, but you shouldn’t give up. You shouldn’t break things when you can build them. You shouldn’t break people down when you can build them up. And you shouldn’t become an ominously bland evangelical and marry a Schwarzenegger 10 years younger than you either.